Calls for tougher tobacco laws have been sparked by Philip Morris International's decision to slash the price of its best-selling Marlboro brand by 40 percent in Senegal. PMI, when contacted by AFP, refused to explain the shock decision to cut the prices of Marlboro -- the world's top-selling cigarette sold in some 180 countries -- to 400 CFA francs (61 euro cents, 79 US cents) from 650 CFA francs. The equivalent Marlboro pack of 20s in France is 5.70 euros ($7.40). The cost of cigarettes varies widely between US states, but typically, a Marlboro pack goes for about $6, according to cigaretteprices.com, a website that compares tobacco prices worldwide. "This drop is unacceptable. Senegal is the only country in the world where one can cut the price of cigarettes and nothing ever happens," said oncologist Abdou Aziz Kasse, who also heads the Senegalese League Against Tobacco (Listab). The Listab, which groups some 15 anti-smoking bodies, has said it will ask the government to force the tobacco giant to reverse the decision and has not ruled out a swoop on the firm's offices in a chic northern Dakar quarter. "Tobacco companies are losing the fight in the West" where anti-smoking laws are gaining teeth but the converse is true of Africa, Kasse said. The outrage has spilled over to other countries, including the United States where Philip Morris is headquartered. The US chapter of the Campaign for Tobacco-Free Kids said in a statement: "Senegal suffers from alarming smoking rates, with nearly one out of every three adults and an estimated 20 percent of youth already smoking." Its president Matthew L. Myers added: "It is imperative that Senegal's government take action to counter PMI's price ploy by increasing the taxes on tobacco products. "Higher taxes are particularly effective in reducing tobacco use among vulnerable populations, such as youth and low-income smokers. Higher cigarette prices are scientifically proven to prevent young people from starting to smoke and encourage smokers to quit," Myers said. Ironically, Marlboro was launched in 1924 as a woman's cigarette, based on the slogan "Mild As May". The filter had a printed red band around it to hide lipstick stains. It soon morphed into a macho cigarette with the iconic Marlboro man -- a rugged cowboy -- finding place in billboards, magazines and television screens across the world and also led to the Marlboro Country advertisement campaigns. Senegal's Health Minister Modou Fada Diagne has denounced the decision as "catastrophic for the health of the people". The National Federation of Parents of Senegalese Students (Fenaps) will "oppose it forcefully", its chief Bakary Badiane said. Badiane, who is vice-president of a continental body of parents of school pupils, said he could "take the fight to an African level to avoid the dangers that threaten children." Smoking can lead to lung cancer, heart disease and emphysema. 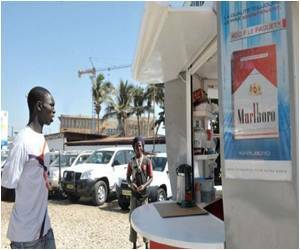 Cigarette prices were freed from state controls in 1994 in Senegal. A source in the commerce ministry, speaking on condition of anonymity, said PMI's decision was aimed "at paying lower taxes". Under the west African nation's tax regime, high-end cigarettes such as Marlboro attract 45 percent tax while cheaper smokes are taxed only 20 percent. According to the body, Senegal's tobacco market was worth 53.5 billion CFA francs (nearly 81.6 million euros) in 2004 and earned the sector more than 48 million euros in profits. Senegal ratified the World Health Organisation's anti-smoking treaty, which came into force in 2005. It requires countries that ratify it to restrict tobacco advertising and sponsorship, put tougher health warnings on cigarettes and limit use of language like "low tar" and "light". The Listab meanwhile wants taxes on tobacco products increased by 50 percent. "We will speed up the process of adopting the law," against smoking, said health minister Diagne, adding that he aimed to increase public health funds with higher taxes.